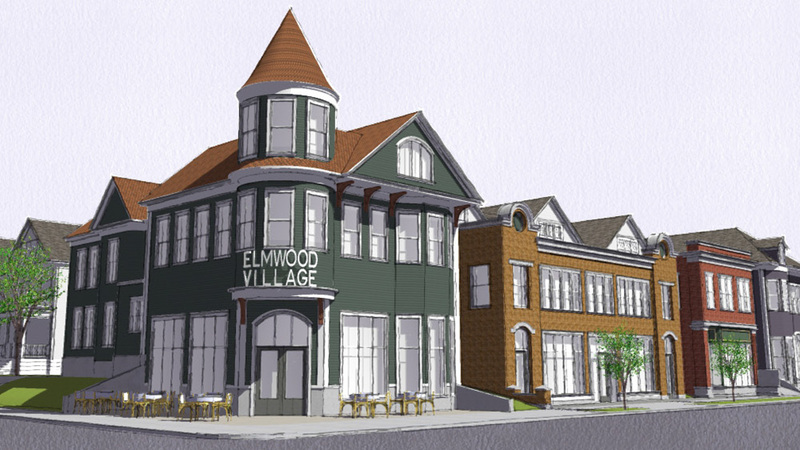 Assemblyman Sean Ryan has taken the unusual step, for an elected official, of hiring an architect and presenting a preservation-focused plan for 100-year-old Elmwood Avenue buildings that two big-portfolio developers want to crush, dismember, and erase. Comparing the Ryan plan for these buildings with the developers’ plans is not just about a different sensibility, but something more basic: Ryan’s plan raises questions about the economic presumptions of the big-portfolio developers. The clusters of 100-year-old buildings at Forest Avenue and at Potomac Avenue on Elmwood are parts of the modest but functional fabric of one of Buffalo’s few remaining commercial strips. The Elmwood strip, from Allentown to Forest Avenue, is two miles of two- and three-story wood-frame houses interspersed with two-story brick commercial buildings whose like are the Upstate New York norm. In all the Erie Canal towns, in most Upstate village centers, in Saratoga, Geneseo, Medina, East Aurora, the pattern of commercial buildings is remarkably consistent. The Buffalo difference, especially on Elmwood Avenue, is the two- and three-story wood-frame houses, many of them with one-story “bump-outs” to the sidewalk, where the modest pedestrian traffic of Elmwood finds clothing stores, music and used-records shops, hair salons, restaurants, gift shops, just about all of them sole proprietorships or family firms. It’s not an accident that national retail brand outlets are not present. (Excepting two national food chains and a phone store.) There are no chain clothiers, such as Anthropologie for women’s clothing, or Joseph A. Banks for men’s clothing, even though the 100-year-old wood-frame houses between Main Street and Grant Street, between North Street and Forest Avenue, house most of the highest-income individuals and families in the city. That’s because there isn’t enough foot traffic to support such retail. And increasingly, the rationale for physical retail space—especially for shoes, electronics, books, and much else—is under assault from e-retailers like Amazon.com. In other words, it’s about scale. Rich, successful developers like the two that are targeting Elmwood Avenue aren’t idiots. They see that there’s a nice, tidy couple of million bucks to be made on each of the proposed projects. Wiping out a century of homely continuity on a commercial strip that’s all about small, locally owned shops will give multimillionaire developers a couple of more projects, and a huge return on investment, at the expense of space that’s less profitable but perfectly functional. There’s nothing illegal about what Ciminelli Development proposes for the two-story building that for decades housed the JP Bullfeathers saloon—except that the newly enacted Green Code, which is the zoning and land-use rulebook for the City of Buffalo, explicitly prohibits structures higher than three stories while Ciminelli proposes to build five. There’s nothing illegal about Ciminelli wanting to crush, dismember, and erase a couple of 100-year-old wood-frame houses on Potomac Avenue and on Ashland Avenue, thus wiping out half a dozen functioning multi-unit dwellings that are today, as they have been for decades, meeting the demand for market-rate rental housing without any the tax credits, abatements, incentives, payments-in-lieu-of-taxes, or other inducements that Ciminelli Development uses whenever it builds anything. Ciminelli Development is just looking to make big money on its proposed demolition of a cluster of functioning century-old buildings that, until recently, have always had tenants. 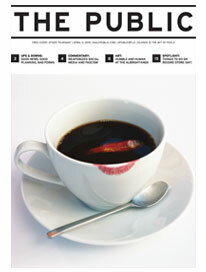 But pay close attention to Ciminelli Development’s website and public presentations. Ciminelli insists that the developer wants to bring a “Georgetown and Saratoga-like feel” to Elmwood. Here’s the difference between beautiful, incredibly rich, crowded Georgetown and Elmwood Avenue: money and population, but mainly money. The median price per square foot of houses in the Georgetown neighborhood of Washington, DC, jumped from $746 to $849 in the last year, according to the real-estate website Trulia. The median price of a listing in Georgetown is $1.75 million. Trulia’s data show that the median price of a listing in the Elmwood Village area of Buffalo is $484,900, and the price per square foot was $156 last year. When one walks in Georgetown, one has to jostle for sidewalk space, at any time of the year. The Wisconsin Avenue and M Street strips, with their national brands, their Dean & DeLuca gourmet shops, their exquisite Powerhouse mall, and their wall-to-wall people are not Elmwood. Trulia reports that the median home price in Saratoga Springs is just $359,000—but that’s for the whole town. Right in the retail area that Ciminelli suggests is comparable to Elmwood Village, the median sale price of a house is over $1.1 million, and in the neighborhood where Skidmore College is, only three blocks away from the commercial strip, the housing drops to a mere $768,000 median price. But Saratoga isn’t just about the folks who live there: Saratoga is a destination, a resort, a convention town with a 150-year-old brand for its combination of horse-racing, mineral-bath spas, and high-end accommodations and retail, all tightly clustered in a dense island of settlement that is only a short drive from New York State’s capitol city. The pedestrian traffic in Saratoga’s high seasons (plural) is not comparable to Elmwood any more than the year-round pedestrian traffic of Georgetown is. In Saratoga’s low season, the pedestrian traffic looks like Elmwood’s—except that Saratoga is in constant demand as a meeting-place for executives, associations, unions, and others seeking a more genteel environment than the usual hotel ballrooms in the Albany suburbs. Buffalo’s Elmwood strip serves locals. Buffalo’s Elmwood strip doesn’t have the density or the community wealth to sustain the per-square-foot retail sales that occur in Georgetown, Saratoga, or even in suburban Buffalo shopping malls—which is why Buffalo’s Elmwood strip doesn’t have national retailers. The proposed condo development at Forest and Elmwood would crush, demolish, and obliterate the 100-year-old wood-frame houses that three successive investors have allowed to deteriorate in what is apparently a 20-year campaign of demolition by neglect, as if there are no officials in Buffalo who can see paint chipping off or the roofing decomposing before pedestrians’ very eyes. There is a market for condominiums, a small market, centered in downtown Buffalo. And there is certainly a market for apartments in—a market that is served already. But what precisely is the need, in this marketplace, for displacing existing renters and small-scale retail from Elmwood? Of course, we are given to big dreams here. The 2007 Urban Land Institute’s charette suggested a lovely dream for what we now call the Olmsted-Richardson Complex, by which we mean the Frederick Law Olmsted-designed grounds of H.H. Richardson’s Buffalo Psychiatric Center. Several dozen high-end condominiums overlooking a college campus may never happen, but the spring of 2017 will see the 88-room Henry hotel open in the complex, which has seen $76 million of New York State funds invested in its stabilization. It’s all coming along beautifully. But there is no particular demand for condos. That’s because of how the population dynamics work here. Elmwood Avenue, Hertel Avenue, the few blocks of Delaware Avenue in Kenmore, a few blocks of Main Street in Williamsville, and a few blocks of East Aurora are what’s left of sustaining retail corridors that contain mainly local proprietorships. As we’ve detailed elsewhere, the Buffalo area is one of the most over-retailed areas in North America. Scholars Mark J. Eppli and Stephen P. Laposa, writing in the Journal of Real Estate Research, came up with a measure: the Gross Leaseable Area, or GLA. The GLA per capita is reported for freestanding retail space, shopping center space, and total retail space. For established East Coast cities and their suburbs, the GLA per capita was less than 10 square feet. Cities that maintained a high GLA per capita, i.e., over 18 square feet, were all younger, high-growth cities and include Dallas, Denver, Las Vegas, Phoenix, and Salt Lake City. The Buffalo area, strangely, has a GLA profile that puts it into the “younger, high-growth” category. This is not a high-growth area. Dare we say it again? The City of Buffalo is still losing population. According to Cornell University’s Program in Applied Demographics, the Buffalo metro is expected to shrink another six to 10 percent by 2030. But here’s what we are looking at today: the fast-growing Washington, DC area has more than 100 shopping centers, more than 119 million square feet of retail space, and 25.9 square feet of retail per capita. It’s one of America’s strongest economic regions and is expected to grow rapidly over the next decade. The Buffalo area has more retail space per capita than DC. More retail, bigger retail, is a really, really bad fit for Elmwood Avenue. But let’s get to who we are. The relevant question is why Elmwood should be revised to acquire the characteristics of places we don’t resemble, and where the numbers are huge. Elmwood has a distinctive look. It’s organic, in the sense that what Tim Tielman calls the “three-story workhorses,” those wood-frame buildings from the early 20th century, serve the purpose of letting homeowners set up little shops in their front rooms, keeping the rest of the house for personal or rental space. If we don’t have the scale for anything different—if our sprawling, over-retailed suburbs have sucked all the retailing energy out of Elmwood, Hertel, Jefferson, Seneca, and the village centers—then we’re blessed to have what we have. And we should keep what we have. Because what we have works. Not in Georgetown, not in Saratoga. But here, in Buffalo. Bruce Fisher is visiting professor at SUNY Buffalo State.